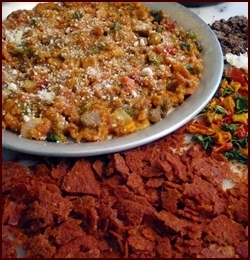 Pasta bark is a unique way to enjoy an Italian flavored pasta meal with a thick texture like chili. I combine it with dried ground beef and vegetables to make a complete meal. One advantage of pasta bark is that you can cook it on the trail without the usual long boiling time and draining off of water associated with pasta. However, you may still enjoy traditional pasta meals with marinara sauce on the trail without blending it into bark first if you use thin pasta like the kind that comes in a box of macaroni or even ramen noodles. In this case, you would make tomato sauce leather instead of bark. Boil one pound of penne pasta or spaghetti for twelve minutes and drain. Combine with 48 ounces of marinara sauce. Avoid tomato sauces containing cheese and cream because they will not dehydrate well due to the fat content and may spoil. A little olive oil in the sauce is O.K. Run the mixture through a blender or food processor in small batches. It may take a few trips through the blender to reduce the pasta and sauce to a mashed potato-like consistency. Small bits of pasta will remain. If the mixture is too thick for your blender to handle, add a little water or more marinara sauce to help it along. Cover your dehydrator trays with Excalibur Paraflexx® sheets or the fruit leather inserts that go with your dehydrator. Place a big blob of the pasta marinara mixture in the center of each tray and spread thinly (about eighth inch) with a spatula. Dehydrate at 135° for 14 hours until brittle. When the pasta has substantially dried into a sheet, flip it over to thoroughly dry the bottom side. The pasta sheet will easily break into smaller pieces when dry. Flip-trick: Place a spare dehydrator tray on top of the bark and flip the two trays over so the bottom side of the bark becomes the top. Add Italian style bread crumbs to your ground beef before cooking and dehydrating to improve tenderness and give the ground beef an Italian meatball flavor. Pack parmesan cheese in a 2 x 3 plastic bag and enclose with other dry ingredients in a 4 x 6 or sandwich size Ziploc plastic bag. Combine dry ingredients, excluding parmesan cheese, in pot with water and soak for five minutes. Light stove, bring to boil, and continue cooking for one more minute or. Place covered pot in insulating cozy for ten minutes. Stir vigorously before eating to complete the breakdown of the bark into sauce. Top with parmesan cheese. 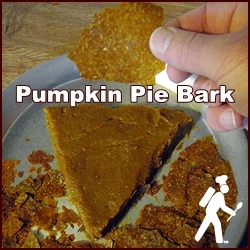 Pumpkin Pie Bark makes a delicious chip to snack on or turns back into pumpkin pie with water.